Eeeek! Scary Brussel Sprouts! Kidding, although I am sure there are those who shudder at the thought of brussel sprouts. If you boil the heck out of them, yes they will taste awful. But roasting is a great way to get some caramelized flavors into brussel sprouts and avoid that sulfury stink that they can get. Also, buy FRESH, small sprouts that are tightly closed. Besides, smaller is better for bento. I did not get these at the farmers market, I picked them up at G&G Supermarket, a great Sonoma County grocery store. 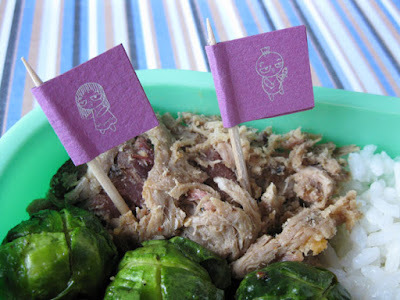 In this bento: BBQ Pulled Pork from BBQ Smokehouse in Sebastopol (SOOO good! ), rice with black sesame seeds, roasted brussel sprouts, a few baby carrots, and a few tiny cherry tomatoes from Middleton Farms. I made my own food picks with craft paper, tape, stamps, and toothpicks. There's a little girl zombie (instead of brains, she is hungry for brussel sprouts), and a boy with a voo doo doll. You may have noticed the teeeny tiny cherry tomatoes in my recent bento box lunches. I picked them up at the Sebastopol Farmers Market from one of the best farmers in Sonoma County, Nancy at Middleton Farms. The quality of her produce is exquisite. 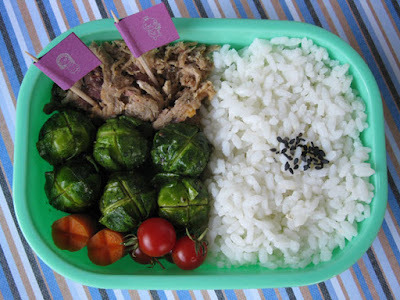 I included this bento in Shannon's What's For Lunch Wednesdays blog. There are lots of great bento ideas there, so be sure to check it out and add your own bento. You still have time to enter my 10,000 Hits Giveaway! Deadline for entry is this Friday, October 8th at noon. That's how I first started to like brussels sprouts was roasting them with some balsamic and olive oil. I brought them to work in my bento and this one teacher complained about the smell! lol! 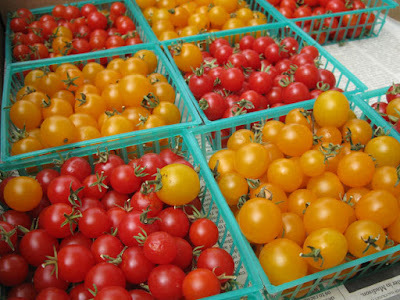 Are the tiny cherry tomatoes the size of grape tomatoes? I love your picks, how fun! Everything looks great! Looks really delish to me!! Super cool picks too! HI Lyndsey! These did have a bit of a smell when I opened the box, but I ate them so quickly it didn't last. The tomatoes are about the size of the tip of my finger. I'll do a perspective shot to show how small they are. I never roasted my Brusells sprouts but looks very delicious in that way. Kids always called it baby cabbage hehehe ... And your tiny cherry tomatoes are the cutest! oo.. love those red and orangy cherry tomatoes and the Brussel sprouts looks yummy too. you mean you coated the sprouts with caramel? cool idea..
Ha ha Lia! It is little baby cabbage. :) Roasting is very easy to do, with oil, salt and pepper. Just stir them up a few times while roasting. I never liked brussel sprouts until my sister made them. What a difference it makes when someone can really bring out its flavours! These are so tiny and cute. Thanks for your tips on them as well. Love the DIY flag pics! Hi Bobo! Actually, to caramelize means to cook something until the natural sugars inside of it start to come out and brown. (very basic definition) It gives the food a sweeter and nuttier taste, but not like caramel the candy. Thanks Kids Dream Work! Congrats on your 1 year blog anniversary! Thanks Chantale! Yeah, brussel sprouts can get nasty if not prepared well. You're welcome Yenny! Making your own flag picks is pretty easy. Could be a fun project for kids! Hi karaimame! Sheri suggests tossing the just roasted brussel sprouts with balsamic vinegar or parmesan cheese, which I think is a great idea and could make them more tasty for kids (and adults). Try one or two little brussel sprouts to see if they like it. :) Actually, I did get to keep the basket with the tomatoes! They tend to rot faster when kept in a bag, that's why these are sold in little plastic baskets. Yum, these sprouts look loaded with flavor! Awesome handmade picks, BB! Brussel sprouts! The way to my heart! Thanks bentobird! Next time I make brussel sprouts I think I will try tossing them with balsamic vinegar after roasting. Trader Joe's currently has brussel sprouts on the stalk. Ever see them like that? They look like they're from outer space. Love looking at them, can't stand to eat them. I've tried them in various ways that people tell me "Oh, if you fix them like THIS, you'll love them!" I've smothered them in bacon, and I've smothered them in cream sauce. Roasted, boiled, and baked. Still can't stand the little buggers, and they stink up the kitchen! Ha ha! No worries dragonmamma. I won't hold it against you. :) Brussels on the stalk do look crazy cool.